Lightning Air, Air Purifier Discounts Apply ! 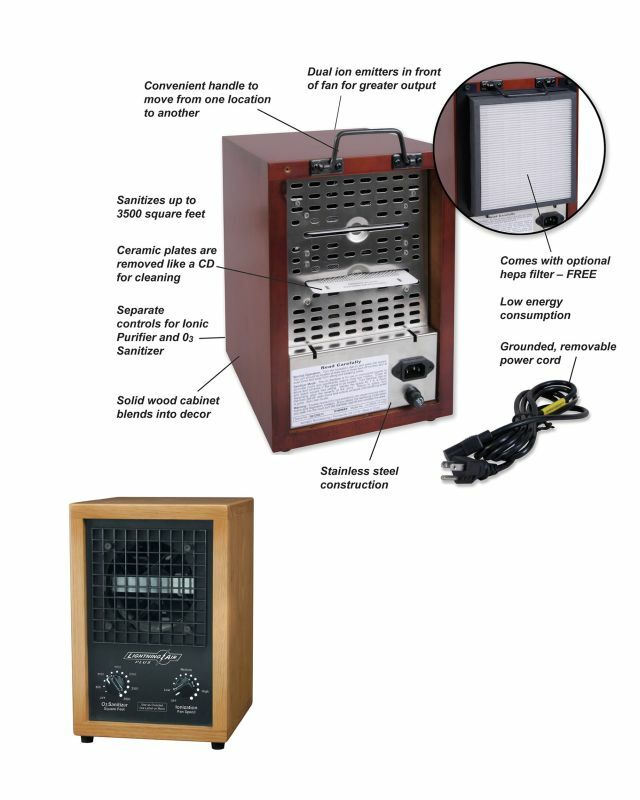 The LightningAir re-creates the same process that Nature uses to keep the air fresh and clean. Just like waterfalls and ocean waves, it generates negative ions that clear the air of dust and other particles. And, like a thunderstorm, it produces 03 to sanitize and remove pollutants without the use of fragrance. The Lightning Air blends into your home decor. The LA-2SPX is for normal indoor spaces such as homes and offices. The LightningAir is not a filter. Instead it re-creates the same process that Nature uses to keep the air fresh and clean. It generates the negative ions that nature uses to clear the air of dust and other particles. Plus it has a built-in O3 Sanitizer to remove odors without the use of fragrances. O3 breaks down mold, mildew and other pollutants at their source. The Ionic Purifier comes on automatically as you turn the unit on. Negative ions can be created around the clock to keep down dust and particulate. The LA-2SPX has a convenient handle on the back and is totally portable. Just plug in and start to enjoy clean, mountain-fresh air for only pennies a day! Durable ceramic plates are removed through slots in the back of the unit like a CD and can be washed with a cleaner for easy maintenance. LightningAir is made of solid wood and stainless steel to blend into the home decor. "We can see quite a difference in our home. We have cats and no matter how well you clean there is always going to be a latent odor. Well, this air purifier really cleaned up that smell! We also use it in the basement and we no longer have a old musty smell down there. This is a wonderful product!"